While Sichuan remains strong in agriculture and rich in natural resources, its industrial sector and high-tech commerce are developing at break-neck speed. Recently, China has been further opening its doors to invite foreign enterprises into its Western region for the ride. Sichuan has quickly become China’s 6th largest economy among all of the provinces. In 2016 its GDP reached an all-time high at RMB 3,268.05 billion (US$491 billion) according to the National Bureau of Statistics. In 2015, the Milken Institute Best Performing Chinese Cities report ranked Chengdu, the capital city of Sichuan, as the #1 second-tier performing city in China. Sichuan takes the lead ahead of its western province neighbors, economy and opportunity wise. What is setting Sichuan apart? Besides its prime location along the river routes of the Yangtze and the accompanying fertile river basin, Sichuan hosts two high-tech industry development zones that have attracted foreign occupants such as IBM, Motorola, Microsoft and Cisco. 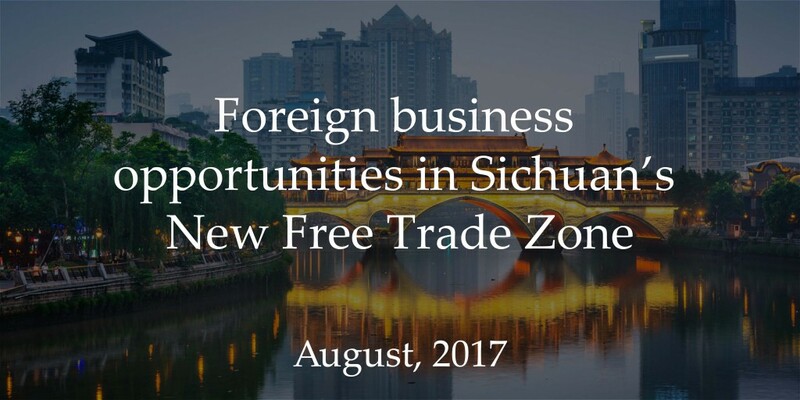 But the most significant addition to Sichuan’s financial scene is a progressive new pilot Free Trade Zone (FTZ), aimed at catapulting a fast-growing economy. The State Council has approved an overall plan to further promote the development in Western China and along the Yangtze River economic belt. As the major component of this plan, the FTZ aims to become a hub of high-end industries and offers a prime opportunity for foreign investors and businesses to take root in this region. Launched on 1 April 2017, the premier high tech, industrial, exhibition and aviation zone covers 119.99 sq kms with plans to establish an extraordinary high-tech park within the site’s perimeters over the next three to five years. One of the specific goals of the FTZ includes facilitating foreign investment and improving free trade. According to the overall plan, the FTZ will pave the way for “further reform and opening up.” One particular show of good faith has been the simplifying of registration for foreign investors. Rather than requiring loads of paperwork and weeks of waiting for approval to establish a business, new companies can expect a turnaround within few days. In the heart of the FTZ lays Sichuan’s shining star—the Tianfu New Area. The Tianfu New Area and its investment advantages are attracting global attention, not to mention a glitzy broadcast of publicity pics in Times Square. The up-and-coming modern services sector will host high-end manufacturing and cutting-edge technology, surrounded by innovation-driven pioneers and progressive finance. Another function of the Tianfu New Area is to serve as an international aviation hub. This past April, the Government of Sichuan Province invited hundreds of foreign and Chinese well-known enterprises to a promotional event in Chengdu, the province’s thriving capital city. The theme? Deepening Cooperation for Common Development. Delegations came from as far away as France and Italy to participate. Perhaps the most important item on the agenda was the “Investment Promotion of Chinese and Foreign Enterprises Visiting Sichuan,” followed by other progressive sessions such as the Development Conference of Entrepreneurs Returning to Sichuan. According to the Sichuan Provincial Department of Commerce, Foreign Direct Investment (FDI) is on the rise. An announcement issued last week claims FDI into China climbed 2.3 percent since this same time last year. This summer more than 2,894 new foreign-funded companies have been established. This trend is obvious especially in high-tech manufacturing and services, which have both risen significantly within the past year. FDI has gained more than 11% in high-tech manufacturing, while high-tech services soared 20.4%. Sichuan’s commitment to attracting FDI has resulted in investments of several prominent businesses such as Sanyo, Kingfisher, UPS, Intel, and Onsun. Due to the increase in foreign investments over the past few years, foreign trade conducted by foreign investment enterprises has grown as well. In 2015, FIE accounted for 46% of Sichuan’s total exports. Beyond its high tech focus, Sichuan also boasts a speeding up in the foreign retail environment. In recent years, foreign-owned storefronts like Carrefour, Metro, Trustmart, Pacific, and Parkson have popped up and are lining the streets of this bustling province. In addition, China is investing in the future not only by welcoming, but also by cultivating entrepreneurship. A current project by the Government of Sichuan Province is providing an opportunity for college students from around the world to come to Sichuan to observe the “flourishing of industries, the charming of technologies, and the path of innovation.” The goal is to encourage innovation and entrepreneurship, essential components to successful business, especially when global partnerships are involved. Over all, profitability of foreign business in China appears to be growing. The American Chamber of Commerce in Shanghai revealed in a recent survey that revenue growth for US companies doing business in China is up 12 percent from 2015. This trend is expected to continue with the opening up of additional China’s Free Trade Zones. Over the past few quarters RMB depreciation has led to massive capital outflow. The Chinese government had therefore to prevent this negative feedback loop to develop further notably by cracking down on investment and acquisitions abroad by Chinese companies. The recent development around Wanda illustrates how tough are the constraints on the Chinese companies. Despite such restrictions towards outbound investment, investing in China and particularly in Sichuan remains promising.